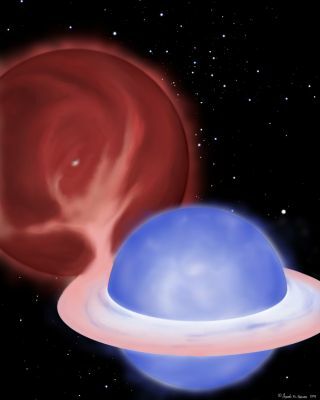 An artist's concept showing a so-called "blue straggler" star stealing mass from its partner in a binary star system. Soon the giant star (upper left) will donate the remainder of its envelope, leaving only a half-solar-mass white dwarf core (shown peeking through the tenuous envelope of the giant) as the companion to the blue straggler. The mysterious origins of the stellar version of vampires — stars that apparently drain life away from other stars to look young — may just have been solved, scientists revealed. Blue stragglers are oddball stars that seem to lag or straggle in age behind the ancient neighbors with which they formed. Instead, they appear inexplicably hotter, and thus younger and bluer. "People have been trying to explain the origin of blue stragglers since their discovery in 1953," said study lead author Aaron Geller, an astronomer at Northwestern University. Now researchers have evidence that blue stragglers are indeed cannibals that rip fuel off their neighbors. Astronomers used the WIYN Observatory in Tucson, Ariz., to analyze 21 blue stragglers in NGC 188, a 7-billion-year-old cluster of about 3,000 stars in the constellation Cepheus, located in the sky near Polaris, the North Star. They combined these observations with computer models simulating the leading theories of blue straggler formation. This image shows the open star cluster NGC 188, with its extra bright "blue straggler" stars circled. These blue stragglers are vampire-like stars that steal material from partner stars to make themselves ultra-bright and young-looking, astronomers say. The scientists ruled out star mergers and interstellar collisions as origins for most of these blue stragglers. Instead, their data suggest they fed off partner stars, "solving the mystery of where these blue stragglers come from," Geller told SPACE.com. The majority of blue stragglers in the study are in binaries — in other words, they have a companion star. The light from the blue stragglers' companion stars is not actually visible, but their effect on the blue stragglers is evident, with each companion pulling gravitationally on its blue straggler and creating a "wobble" as it orbits. "It's really the companion star that helped us determine where the blue straggler comes from," Geller said. "The companion stars orbit at periods of about 1,000 days, and we have evidence that the companions are white dwarfs. Both point directly to an origin from mass transfer." The wobbles the researchers saw hint that each companion star of the blue stragglers is about half the mass of the sun, which is consistent with a white dwarf. The other theories of blue straggler formation require the companion stars to be brighter and more massive. However, although their findings account for most of the blue stragglers in NCG 188, the researchers do note a few might have been created by other methods. For instance, two of the blue stragglers in binary systems likely had other kinds of encounters, and potentially collisions, with other stars at some point, Geller said. In addition, five of the 21 blue stragglers analyzed apparently did not have companions, and "we do not have enough data on the blue stragglers that currently appear to be single to say where they come from," he added. "It is likely that multiple formation mechanisms are response for producing the full blue straggler population in the cluster," Geller said. The researchers will now use the Hubble Space Telescope to search for ultraviolet light from these hidden companions, to confirm if they are indeed white dwarfs. Geller and Mathieu detailed their findings in the Oct. 20 issue of the journal Nature.